Relax and enjoy the 'good life' in this comfortable, well appointed, two bedroom, two bath, ground-floor condo. No need to walk up stairs or wait for the elevator. The front door is just steps from the parking lot! Located in the beautiful Gulf Place Resort along scenic Highway 30A, you have immediate access to two full-service restaurants, a pizza parlor, coffee shop, beachwear clothing boutique, full-service pharmacy and a beach equipment rental shop where you can rent everything you need to enjoy the beach including bikes, paddle boards and kayaks. Gulf Place also includes swimming pools, tennis courts, walking trails and shuffleboard. Why would you look anyplace else, when everything you need for a great vacation is right here! 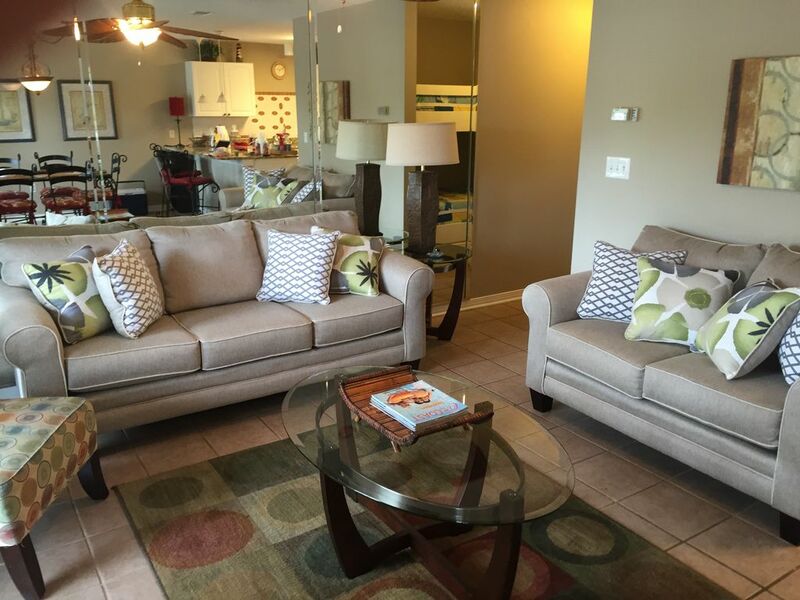 The warm, colorful living area includes a plush, comfortable sofa that seats three with a matching love -seat for two. It also includes a cable (flatscreen) TV with over 60 channels and a DVD player with lots of movies for the family to enjoy. Bedrooms are comfortably furnished with cushy, pillow-top, king sized beds and each has a flat screen TV with cable connection as well as overhead fans. There are snug, recessed bunk-beds in the hall. There's plenty of room for the whole family but cozy enough for two. This home away from home is furnished with all the necessities for a fun-filled vacation or a relaxed getaway. The kitchen has everything you need to make a meal for the family or a romantic dinner for two. There's a full set of dishes, lots of pots and pans, several sets of glasses, a coffee pot, toaster, microwave, crock pot, blender, electric griddle and just about every utensil you should need. The dining area is quite roomy, the dining table comfortably seats six and there are also two bar stools at the kitchen countertop seating area - it's just right for getting everyone together to reconnect and enjoy a meal with friends and family. The condo's private patio has a peaceful outdoor sitting area that overlooks a pond and fountain, there's a table and seating for four that is perfect for meals or a game of cards. The private pool and hot tub are located just 25 feet from the back door! The beach with the powdery white sand and beautiful calm waters is directly across the street, with convenient access via three private walkways. We like to take our chairs and a beverage and relax on the beach while we enjoy a breathtaking sunset. Heavenly! Trust me, you will not want to leave this place. This restful haven is in a quiet area of Santa Rosa Beach, but only ten minutes from all the tremendous shopping, restaurants, and entertainment located in Destin and Seaside. The beach is just across the street and over Gulf Place's private boardwalk...about a 2 minute walk. The private patio overlooks a scenic pond with a fountain. Free parking in the lot directly behind the unit. Private, reliable WIFI, free to all Gulf Place guests. The dining area seats six with two bar stools for additional countertop seating. 3 Flat Screen TVs with over 60 channels of cable. Lots of books for your vacation reading. Cards, puzzles, dominoes and Yahtzee. Available for rent from a business located on the property. Nice private patio that overlooks a pond and fountain with a table and four chairs. Great for morning coffee or evening drinks. There are tennis courts for use of all Gulf Place visitors. Many great public courses located just a few miles away. Though this is a ground floor unit, it would not meet ADA guidelines for wheelchair accessibility. There is a pool located 25 ft. from the back door! We're glad you enjoyed yourselves! Very nice place. Close to the beach. Grill is located right outside the door. Condo was clean and well supplied. We're so glad you found everything to your satisfaction and hope you'll return soon! My son, daughter-in-law, and grandchildren stayed in this condo for a week. They loved it! They thoroughly enjoyed the ground floor unit just steps from the pool! The condo was extremely well equipped for a family of five. They love the location of the grill just steps from their patio and my daughter-in-law loved having the washer and dryer right inside the unit. Beautiful beach, beautiful condo and the whole family in the same complex! What more could anyone want? Thanks Pam! I'm so glad you had a nice time. We strive for our guests to have a positive experience!! Perfect setting and location with a wide variety of amenities. The pool was a few steps away and clean and the beach was across the street. I WILL DEFINITELY GO AGAIN. We're so happy you enjoyed yourself and look forward to your return! Please note that per the Condominium Association rules, guests are not allowed to have pets on the premises.